Staphylococcus is a group of bacteria that can cause a multitude of diseases as a result of infection of various tissues of the body. 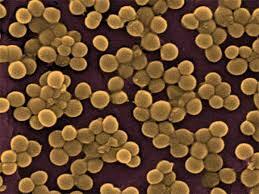 Staphylococcus is more familiarly known as Staph (pronounced "staff"). Staph-related illness can range from mild and requiring no treatment to severe and potentially fatal. Over 30 different types of Staphylococci can infect humans, but most infections are caused by Staphylococcus aureus. Staphylococci can be found normally in the nose and on the skin (and less commonly in other locations) of 20%-30% of healthy adults. In the majority of cases, the bacteria do not cause disease. However, damage to the skin or other injury may allow the bacteria to overcome the natural protective mechanisms of the body, leading to infection. Anyone can develop a Staph infection, although certain groups of people are at greater risk, including newborn infants, breastfeeding women, and people with chronic conditions such as diabetes, cancer, vascular disease, and lung disease. Injecting drug users, those with skin injuries or disorders, intravenous catheters, surgical incisions, and those with a weakened immune system all have an increased risk of developing Staph infections. Staphylococcal disease of the skin usually results in a localized collection of pus, known as an abscess, boil, or furuncle. The affected area may be red, swollen, and painful. Drainage or pus is common. In cases of minor skin infections, Staphylococcal infections are usually diagnosed by their appearance without the need for laboratory testing. More serious staphylococcal infections such as infection of the bloodstream, pneumonia, and endocarditis require culturing of samples of blood or infected fluids. The laboratory establishes the diagnosis and performs special tests to determine which antibiotics are effective against the bacteria.